Marxism is a pseudoscientific field of social studies that began as a revolutionary movement developed by the German scholar and activist Karl Marx and his collaborator Friedrich Engels. Marx's approach is indicated by the opening line of the Communist Manifesto (1848): "The history of all hitherto existing society is the history of class struggles." Marx believed that capitalism, like previous socioeconomic systems, would produce internal tensions which would lead to its destruction. Just as capitalism replaced feudalism, capitalism itself will be displaced by communism, a classless society which would emerge after a transitional period in which the state would be nothing else but the revolutionary dictatorship of the proletariat. Marxists are said to await "the revolution" with a religious fervor reminiscent of Christians awaiting the Rapture. Marx, when forming Marxism, also had in mind a particular event for his inspiration for the ideology: Long enamored with the French Revolution and its excesses, he advocated in a private letter to his co-author of the movement, Friedrich Engels, as well as other sources such as a leftist newspaper, that they create "revolutionary terror" and that once they are at the helm, they would be obliged to reenact Robespierre's Reign of Terror from 1793, and that once their time comes, they won't excuse their terrorism, citing they will be pitiless and thus won't expect mercy from the monarchies, with the vengeance of the people being such that it would overtake even Robespierre's Reign of Terror in terms of blood spilt. He also fully acknowledged that they would be considered monsters as a result, but they wouldn't care less either way. Communism, as it emerged around 1918-20, was a late political manifestation of Marxist philosophy. Lenin in Russia and later Mao Zedong in China tailored Marx's ideas it to their expedient political needs. According to the formal ideology of Marxism, private ownership in industry is to be eliminated—control is to be wrested by the masses as a whole. The crucial revolutionary act, therefore, would presumably be the actual taking of control in industry by the workers themselves. In the course of the Bolshevik revolution, the workers ousted not only the owners but all the directing staff and supervisors. The workers thought, in their own way, that the revolution was designed to rid them of all rulers and exploiters. They recognized that the managers, as well as the owners, were among the rulers and exploiters both of the past and, above all, of the future. The workers set about running the factories themselves. This state of affairs did not, however, last long. Two issues were at stake. In the first place, the separate factories and other instruments of production were not run very well under workers' control; and there were even greater difficulties in the coordination of the efforts of various factories. It was even harder for them to collaborate in the theory of economic planning effectively to direct entire branches of industry. Workers' control would also mean the elimination of all privilege, or a 'classless society". The drive for class power needed to get rid of workers' control, and found justification in the inefficiency of workers' control. Hence workers' control was replaced by Lenin, Trotsky, and Stalin by the de facto managerial control in a new kind of state. The technical direction of factory operations was turned over to "specialists", or managers, with the Factory Committees remaining in existence and still exercising substantial control through a veto power over the managers and jurisdiction over labor conditions. Meanwhile, bureaus and commissions and individuals appointed from above by the Soviet regime were beginning to take over the job of coordinating the efforts of various factories and branches of industry. The powers of the managers and technicians increased at the expense of "workers' control" and the Factory Committees. The Factory Committee lost their veto powers. Their prerogative, labor conditions, became more and more narrowly interpreted. The Committee composition was changed to include one state representative, one managerial representative, and one man nominally representing the workers. Finally, even these Committees lost all their real power and remained as mere formalities, to be dropped altogether in during the Great Purge of 1938. The freedom and end of privilege, which the oppressed thought the revolution was to bring, was giving way to a new form of class rule by the nomenklatura. At each decisive step, the "workers' socialist state" under Lenin and Stalin, backed not the workers but the managers. A wide campaign of "education" was undertaken to show the people why "workers' rule" meant, in practice, managers' rule. Where necessary, the education by the word was supplemented with education by firing squad, concentration camp or forced labor battalion. Lenin and Trotsky, both, in the early years of the revolution, wrote pamphlets and speeches arguing the case of the specialists, the technicians, the managers. Lenin, in his forceful way, used to declare that the manager had to be a dictator in the factory. "Workers' democracy" in the state, Lenin said in effect, was to be founded upon a managerial dictatorship in the factory. Lenin, as the head of the state, helped to smash workers' popular, control over those instruments and to substitute for it control by the managers. And, of course, the managers of individual plants became subordinate to the big managers, to the boards and bureaus directing entire sectors of industry and governing industry as a whole. The managers under the new state included many who had been managers under the old "capitalist rule". Lenin and Trotsky poured scorn on "infantile leftists"  who were against making use of the "services" of the "bourgeois specialists.". Favorable terms were given to foreign "bourgeois specialists" who were willing to come to work under the new regime. The control, and the social rule which goes with it, when it leaves the hands of the capitalists, goes not to the workers, the people, but to the managers, the new ruling class. A parallel of the Russian process can be observed with particular clarity in connection with the events in Loyalist territories during the Spanish Civil War, above all in Catalonia. There, just as in Russia, the workers and peasants began taking over direct control of the factories and railroads and firms. There too, not at once, but during the course of the first two years of the Civil War, the de facto power slipped from the workers' hands, sometimes voluntarily given up at the persuasion of a political party, sometimes smashed by arms and prison. It was not the troops of Franco who took control away from the people of Catalonia; they had lost control well before Franco's army conquered. Max Horkheimer, Theodor Adorno, and Jürgen Habermas, leaders in the Frankfurt School. For a more detailed treatment, see Cultural Marxism. Cultural Marxism is a branch of Marxist ideology formulated by the Frankfurt School, which had its origins the early part of the twentieth century. Cultural Marxism comprises much of the foundation of political correctness. It emerged as a response of European Marxist intellectuals disillusioned by the early political failures of conventional economic Marxist ideology. 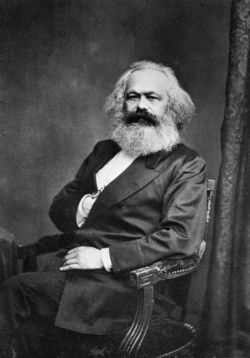 While Marx's Communist Manifesto focused on the alleged class struggle between bourgeois (owners of the means of production) and proletariat (workers), Marx did address culture, which he intimated would change after his economic vision was implemented. Patrick Buchanan argues that Cultural Marxism succeeded where Marx failed. The central idea of Cultural Marxism is to soften up and prepare Western Civilization for economic Marxism after a gradual, relentless, sustained attack on every institution of Western culture, including schools, literature, art, film, the Judeo-Christian religious tradition, the family, sexual mores, national sovereignty, etc. The attacks are usually framed in Marxist terms as a class struggle between oppressors and oppressed; the members of the latter class allegedly include women, minorities, homosexuals, and adherents of non-Western religions such as Islam. A Marxist society does not allow an individual to gain wealth; instead, that wealth belongs to the people as a collective. In a 'pure' Marxist society, the state is a democratic system that manages all aspects of production—essentially making the state the head of all industry. However, this was never realized due to power grabs by the eventual managers of the factories, as well as many practical limitations. Marx dreamed of a society where a man could be "A farmer in the morning, a laborer in the afternoon, and a philosopher in the evening"—essentially, a world without specialization and stark divisions of labor. Again, this tenet of his philosophy was never realized, mostly due to practical reasons. Following the writings of Marx and Engles, along with other Marxists, Marxism stands in opposition to the institution of marriage. Comparative quotes are given from the top Left-wing - Socialist - National Socialist (a.k.a. Nazi) - Marxist - Communist leaders and their critics in order to better understand the commonality of the end result of their philosophy taken to its fruition by the Big government Welfare state-Nanny state-Police state by leftist Globalist-Statist-Socialist-Communists. From these quotes one can see little difference between Socialists, Nazis, Communists. Communist regimes killed 60 million in the 20th century through genocide, according to Le Monde and more than 100 million people according to The Black Book of Communism. "There is only one way in which the murderous death agonies of the old society and the bloody birth throes of the new society can be shortened, simplified and concentrated, and that way is revolutionary terror. "-Marx, Karl, “The Victory of the Counterrevolution in Vienna”, Neue Rheinische Zeitung, November 1848. "Exterminate the 50 million Vietnamese... and purify the masses of the [Cambodian] people." ↑ V. I. Lenin, "Left-Wing" Communism, An Infantile Disorder (1920) V. I. Lenin, Selected Works, English edition, Foreign Languages Publishing House, Moscow, 1952, Vol. II, Part 2. ↑ cf. External source: Cultural Marxism: The Corruption of America is a James Jaeger Film with ambition to show how a love affair with collectivist ideologies has lead to ever bigger government and the welfare-warfare state. Led by a Marxist splinter group called the "Frankfurt School" -- "the long march through the institutions" has infiltrated every corner of Western culture to corrupt traditional Christian values with "political correctness," another name for "cultural Marxism." ↑ cf. The tendency of dictatorial ideologies to influence public institutions etc. so that these would serve their agendas is termed as Gleichschaltung. Marx and Lenin Clairemont paper at Hillsdale College. This page was last modified on 8 April 2019, at 14:20. This page has been accessed 55,136 times.